One of the worst nightmare one could have is that food runs out at a wedding. It happened to a friend of mine because all his friends, even the ones not invited decided they wanted to be a part of the celebrations!! Well have a similar story that happened 2000+ years ago and is recorded in John chapter 2 - the famous wedding feast of Cana. Weddings are a happy day in most cultures- the bridal couple have their day in the sun!Celebrations are always elaborate and last a few days in rural settings. Now here is a wedding and what makes it different from other weddings is this - they have run out of wine! Jesus and his disciples are at the wedding too.Jesus has just embarked upon his ministry. Maybe he was related to the bridal couple which is why Mary might have been involved in the supervision of the catering and the guests. That is how she probably knew about this embarrassing situation, that the wine had run out. this family faced a crises. Are we facing a crises of some sort in our life? 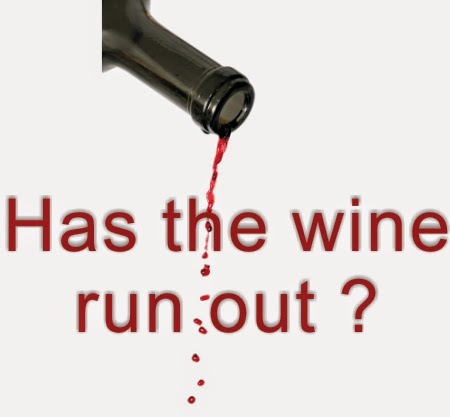 Has our wine run out? We all have different situation were our wine could have run out. Maybe is a health issue, finance, a work situation, relationships issues, infertility etc. So Mary comes to Jesus with this problem and Jesus' response and form of address is very strange. He was not being disrespectful but he was establishing a change in their relationship. His ministry had just begun. So what should we do when our wine runs out? We try and do things on our own. The best advice is to "do what he tells you to do"
Matt 6:33-37. This is the key and its a powerful verse. When we seek God's kingdom first everything falls in place. What does this mean? Put God first, get rightly related with God and the church. Breakthrough comes when we faithfully seek God's kingdom. So the wine has run out! Jesus tell them to fills the jars that are used for ceremonial washing. The servants could have rejected the instructions. Sometimes Jesus asks you do illogical things. We all have situations where the wine has run out. We should just obey God. We might not see results immediately.Elijah prayed several times for rain. The question is will we believe God and continue to obey him in the waiting. This is the first miracle that Jesus did and here he demonstrates that he is the Lord of all creation. Its an opportunity for Jesus to reveal His glory. The ceremonial jars were a part of the Old Covenant. Jesus was saying , I'm done with the Old covenant. Now His blood cleanses us and gives us new life.